JEMEZ – Due to multiple sightings of bear cubs by campers in the area of Forest Road 376 in the Jemez Mountains, recreationists are reminded to keep a clean camp and be bear aware during the long weekend. The department strongly urges you to avoid getting between the mother and her cubs. Bickford continues, “Always be aware that the mother is likely in the area. Approaching wildlife is dangerous and getting into the personal space of any wild animal is a bad idea.” The department will have extra staff in the area to ensure safety of the public and wellbeing of the bears. The state has experienced less than average precipitation for this time of the year, which means that bears may be in search of other food sources, said Rick Winslow, cougar and bear biologist with the department. “Droughts historically have led to a lot of bear conflicts, not only at camping and picnic sites, but also in more populated areas,” said Winslow. 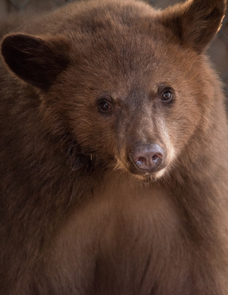 Due to the recent increased bear activity, people should be even more diligent about keeping campsites clean and paying attention to their surroundings when visiting bear country. Give the bear plenty of room to escape, so it doesn’t feel threatened or trapped. If a black bear attacks you, fight back using anything at your disposal, such as rocks, sticks, binoculars or even your bare hands. Aim for the bear’s nose and eyes. If you are experiencing a persistent problem with bears, please contact your regional Game & Fish office or contact your local law enforcement for immediate assistance. Visit the department’s website to find contact information: http://www.wildlife.state.nm.us. For more information about living with bears in New Mexico please consult Keeping Bears Alive and Yourself Safe.